The Game Mechanic: What's So Great About Blade Bind? What's So Great About Blade Bind? It's my birthday today, and yet another attempt to run a face-to-face playtest of Blade Bind has fallen through (I think this makes five times, now)! But not to fret – I've run a couple of online playtests since my last development post, and I just had a brainwave yesterday that seems promising, so things are looking generally positive! I was going to write up playtest reports, but after waiting a few days to let the outcomes percolate through my brain I kind of ran out of steam on that front. Today, rather than bore you with my mechanical musings (which I may save for a later post), I thought I'd talk a bit about why I think Blade Bind is so cool. I've used my several years' experience with historical fencing to develop a card-based duelling system that's abstracted and relatively simple, yet with all the tension, tactics, and risk-taking of an actual sword-fight. During the setup, random prompts and evocative art help the group quickly give shape to their characters and the things they fight about. In one playtest, the Blades Michael (the archangel feather) and Templar (the plate-armour) led to a story about an esoteric Christian cult and the last guardian of the Holy Grail. Drawing for random archetypes and relationships has led to intriguing combinations, such as a selfish ascetic and a pair of volatile lovers. Once the setup's complete, the game explodes out of the blocks with instant conflict! While your power will increase as the game progresses, the stakes are high right from the start. As your very first scene you can attempt to seize control of an organisation, assassinate your target, or destroy the evil artefact. The stakes only get higher as you wrestle with your own Blade for control of your burgeoning power. As the game progresses, there's a struggle between trying to get your Power high enough to win duels, while not having it exceed your Will (because you'll turn into a "Bladebound" puppet controlled by the Blade). The Blade constantly tempts you to raise your Power, but losing your grip on the things you care about causes your Will to slip. While Will constantly shifts up and down, Power can only increase – thus the balancing act becomes ever-more precarious. Inspired by Shinobigami, Blade Bind provides a rigid scene structure and conflict resolution. While you can try to persuade people to your cause, Duelling is the only mechanical resolution system. The winner gets to decide the fate of whatever's at stake, or they can rewrite one of their own goals or a goal belonging to one of the vanquished. While it's possible to resolve the game purely mechanically with no roleplaying, the setup creates characters with a web of relationships and motivations, which tends to inform your decisions. It really is designed around melodrama and tragedy, and roleplaying your character to the hilt with scenery-chewing portrayals really brings the game to life. You may find your character's goals forcibly rewritten, but as with Fates in Tenra Bansho Zero, this also helps inform your roleplaying and describes your character's story arc. When people really get into character and describe cool, evocative lead-ups to duels, it's like story-mode on a console fighting-game! 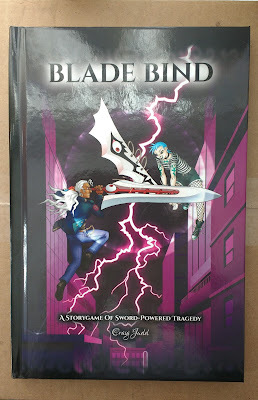 While Blade Bind certainly won't be everyone's cup of tea, I'm really excited to be developing it, and hope that I can connect with players who revel in the experience it creates!